When elections near, strange things happen. But how strange was last week? We had a ghost come to Parliament… but I am getting ahead of myself. Let me begin with Monday, March 26. 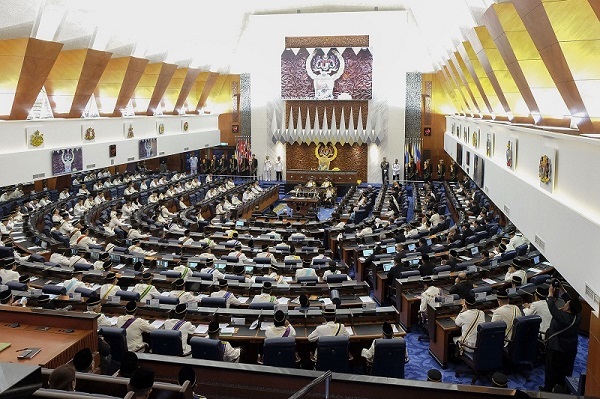 The week opened with three DAP lawmakers, Ngeh Koo Ham (Beruas), Nga Kor Ming (Taiping), and V Sivakumar (Batu Gajah), being suspended by Dewan Rakyat speaker Pandikar Amin Mulia. The reason for their suspension? Simply because the trio voiced an objection against the speaker’s rejection of an emergency motion on the seizure of Jho Low’s luxury yacht Equanimity by Indonesian authorities, and other 1MDB-related questions. Pandikar has consistently rejected 1MDB questions in the past, citing among others, the issue being sub judice as it is being tried in the US. Instead of allowing Parliament to debate 1MDB – commonly dubbed the “Mother of all scandals in Malaysia” – the speaker chose to respond to allegations of his compromised impartiality by resorting to high-handed actions against parliamentarians. Two days later, as a protest was taking place outside Parliament, Prime Minister Najib Abdul Razak was supposed to table a motion on electoral boundary redelineation. The motion consisted of a report by the Election Commission which was distributed to MPs six days before. The report, however, was embargoed even though it was distributed earlier. In fact, when it was first distributed on March 22, the speaker said that MPs were not allowed to read it nor to bring it out of the House until six days later. His exact words, according to the Hansard, “Boleh feel, boleh pegang sehingga Rabu… jangan bawa pergi mana-mana.” (You can feel it, and hold it until Wednesday… [but] do not bring it out). As such, prior to the tabling of the motion by the prime minister, Gelang Patah MP Lim Kit Siang stood up to question who gave the power to enforce such an embargo on the EC report. The speaker not only refused to entertain Lim’s simple question, but ordered him to leave the House. When Lim refused to back down, Pandikar called on the government to move a motion naming Lim to suspend him from Parliament for six months. Minister in the Prime Minister’s Department Azalina Othman Said moved the motion to suspend Lim under Standing Order 44(3). No debate nor vote was called on the motion. Pandikar then adjourned the House, but not before threatening to call in the police if Lim was still in the house after the adjournment. For a speaker in a democratic Parliament to make such statement is utterly shocking. Parliamentary tradition does not allow armed personnel to enter the House. Nearly 400 years ago, in 1642, when King Charles I entered the House of Commons with armed guards to arrest parliamentarians, he triggered the English Civil War, which ended with the beheading of the king himself. To this day, because of that incident, the British monarch is not allowed into the House of Commons. Since Azalina’s motion was not debated nor voted upon, Lim stood his ground and remained in the House till the end of the day’s session. However, when a division (voting) was taken at the end of the redelineation motion, Lim, who was present and voted against the motion, was not counted by the speaker. It is still Wednesday March, 28. The prime minister eventually tabled the motion at about noon. For such an important motion which would have a significant impact on the future of our country, only five opposition MPs were allowed to debate. Even then, each MP was only allotted 10 minutes each. Members of civil society, election watchdogs and scholars have called the government’s redelineation plan malapportionment, or the manipulation of electorate size to give an advantage to the ruling party. One glaring evidence of such malapportionment is that the average number of voters per constituency for BN seats after redelineation is 59,969, while for the opposition, it is 83,150. Another critical problem with the redelineation is a worsening of racial division, with the creation of so-called super-Chinese and super-Malay majority constituencies. Some heterogeneous constituencies were reapportioned to become single-race majority constituencies. For example, Lumut, which was previously composed of 51 percent Malay, 35 percent Chinese, 12 percent Indian and 1.5 percent other voters, will become 71 percent Malay, 16 percent Chinese, 12 percent Indian and 1 percent other. Even MCA and Gerakan leaders had voiced their objection against the redelineation in the media because of this reason. Yet when it came to voting in Parliament, all MCA and Gerakan MPs – including their presidents, who had made their objections public – voted to support the redelineation. Then finally, on Thursday March 29, the ghost appeared in Parliament. After the morning question time, the Umno MP for Setiu stood up to point out that Lim was still seated in the House despite being suspended by the speaker the day before. Citing Selwyn Lloyd’s memoir, “Mr Speaker, Sir”, Pandikar said he found inspiration to “just turn a blind eye as if you don’t see.” As such he ruled that he “does not see” the Gelang Patah MP in the House, even though he was there, and that Lim could not participate in the proceedings. In other words, the speaker treated Lim Kit Siang as invisible. Pandikar was clearly aware that he was setting a precedent. The speaker of course is a very powerful position. Many are already familiar with how the speaker can “stop the clock” to allow parliamentary proceedings to go on beyond 12 midnight. But in this case, Pandikar can also rule that someone is invisible and inaudible in the House. BN backbenchers and ministers had a field day with the ruling. Urban Wellbeing, Housing and Local Government Minister Noh Omar mocked Lim, saying he heard a very familiar voice but could not see anyone. At one point, Umno’s Sungai Besar MP shouted, “There is a ghost’s voice,” to which Noh agreed. If anything, Lim is the Spirit of Conscience. No wonder those who are blind to their own conscience in support of a kleptocrat failed to hear and see him. I am not an expert on Lloyd’s speakership, but simple research showed that his action of being “deaf or indeed blind” was actually to justify his inaction to discipline an opposition MP – for physically attacking the home secretary in the House. For a variety of reasons, Lloyd refused to take any disciplinary action against the said MP, and hence, his statement that “there are times when the Chair can appropriately be deaf or indeed blind.” Lloyd was trying to protect a minority MP (who had physically harmed a minister) from being disciplined, while Pandikar was punishing a minority MP for merely asking a question. After lunch on the same day, at about 2.30pm, the government tabled yet another controversial law, this time the Anti-Fake News Bill 2018. This Orwellian legislation gives the government power to decide what is “true” and “fake” news. Anyone convicted under this law can be jailed up to 10 years’ or fined half a million ringgit, or both. If passed, the new law will be another addition to the string of anti-democratic, draconian legislations already in place. Only about a month before, artist Fahmi Reza was sentenced to one month jail and fined RM30,000 under the Communications and Multimedia Act 1998 for merely for drawing a caricature. The original plan was to bulldoze through this Bill on the same day, but somehow, the session was adjourned to be continued on the following Monday. It may already be too late to speak up. It was an exhausting and a very strange week in Parliament: from the high-handedness of the speaker to suspend four opposition MPs in one week, to the secretive book which was given to MPs but could not be read for six days, to the action against Lim Kit Siang, the threat to call in the police, the passing of the new electoral coundaries, the tabling of the Orwellian anti-fake news law, the speaker’s power to turn Parliament blind and deaf, and the appearance of a ghost.